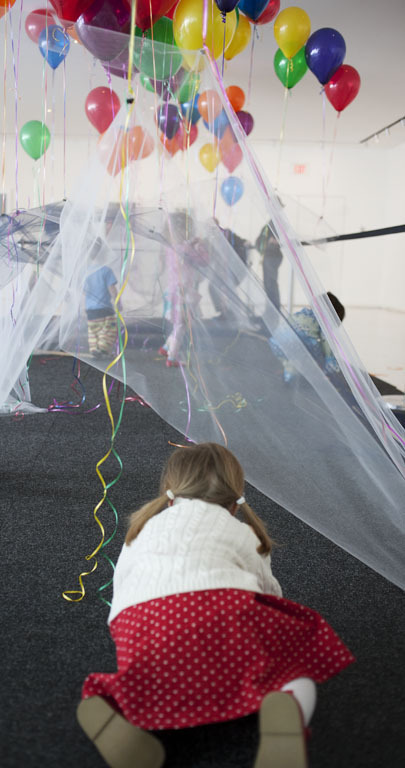 Guest blogger John Comazzi, Assistant Professor of Architecture at the University of Minnesota’s College of Design, was part of a team of design educators that recently led the wildly successful Playscapes activities at February Free First Saturday. In his ongoing research he’s interested in the relationships between early childhood education and the design of active learning environments. Two weeks ago, during the February 6th Free First Saturday, my colleagues (Kristen Murray, Adam Jarvi and Wendy Friedmeyer of D.E.M.O) and I were nearly overrun by a small cadre of future designers and artists busily creating elaborate constructs made of gum drops, marshmallows and helium-filled balloons. Sticky, spiky, colorful structures, resembling the collaborative efforts of Buckminster Fuller and Willy Wonka, quickly filled the otherwise serene spaces of the Walker’s lobbies and lounges creating a spectacle that went toe-to-toe with the extraordinary works of art in the adjacent galleries. Inundated and overwhelmed by the scope and scale of creative production, we fully realized this was a predicament of our own devising. We had completely lost control, and had no one else to blame. This was a total success! True to any design activity, we had no way of fully anticipating the extent to which our projects would initiate meaningful (not to mention fun and playful) experiences for the children, adults, the Walker staff, or even ourselves. But, as designers, we have grown accustomed to embracing indeterminacy and have become quite nimble when negotiating the unintended consequences of our most well-intentioned plans. In short, we relied on our collective experiences in design and education and devised a rather straightforward plan for success: keep it simple, and get out of the way. So, at 10:00am on a cold Saturday in February, we offered up an array of tantalizing materials that would most certainly appeal to even the most discerning or cautious child passing through The Walker that day. In the Cargill Lounge, we lured them in with large containers of gum drops and marshmallows coupled with a range of everyday, loose parts suitable for free-form constructions (mainly toothpicks and skewers), while in the Bazinet Lobby we offered up 85 helium-filled balloons with strings and thin fabrics for the construction of air-filled structures of a most fantastical nature. Within less than an hour, Playscapes went viral, fully demonstrating the Walker’s ongoing commitment to providing social spaces and open activities to foster collective experiences around art and design. In a flurry of design activity, the Cargill Lounge quickly swelled into a small city of colorful and sticky structures that created a brilliant counter point to the minimalist installation by Robert Irwin in the gallery next door (Slant/Light/Volume). And in the Bazinet Lobby, throngs of busy space-makers filled the room with colorful buoyant structures that acted as the perfect foil to monolithic nature of the original brick-built Walker. Looking back, the outcomes of the day’s activities should have been of little surprise. Clearly, I offer these reflections with a wink and a nod and certainly don’t intend to saddle these otherwise innocent and playful experiences with the serious expectations of a stodgy adult. But if we shift our perspectives and consider the multiple intelligences activated by both play and design, it might just open up new opportunities to sponsor the kinds of creative problem solving skills, collaborative learning and insatiable curiosities necessary for life-long learning and projective practices that will benefit us all. Note: We would like to extend enormous gratitude to the Walker staff and volunteers who helped to manage the not-so-controlled chaos throughout the day. And, many thanks to the Walker itself for inviting such raucous, rough-and-tumble play into your institution.